I thought a few pictures of my sewing room layout would be a good idea. It’s all cleaned up right now —- I recently went through almost everything in my sewing room and I think it’s time for some pictures before I mess it up again!. My sewing room is upstairs - it started out as a guest bedroom - but it is upstairs and our bedroom is upstairs. We soon discovered we preferred having guests farther from us, rather than closer, so we moved our guest room to the basement. We don’t have our own bathroom in our bedroom but there is one on the upstairs level. So upstairs we have our bedroom, my husband’s office, my sewing room and a bathroom. It’s actually perfect - as the bathroom is right across from my sewing room! The only thing not perfect is the carpet on the floor. Carpet in a sewing room is definitely not ideal. 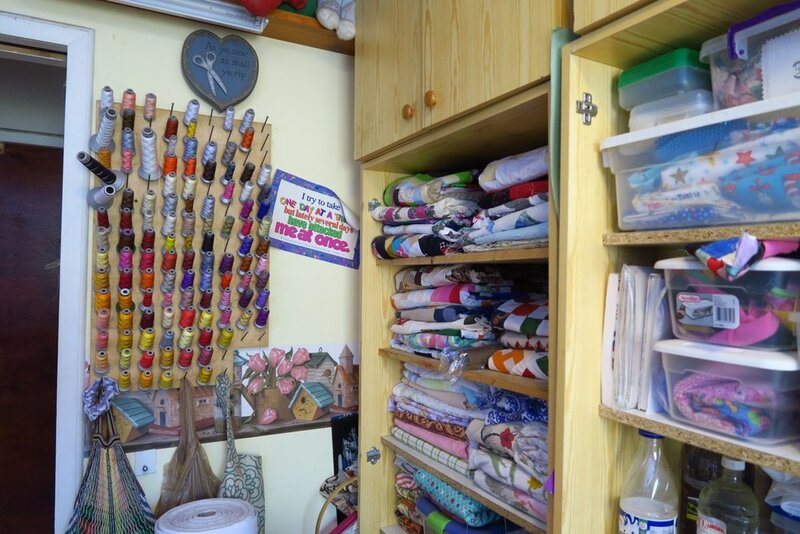 I know some prefer to call their sewing room their studio. I don’t worry about what you call it - I actually prefer sewing room as I don’t bring in other people into it. I think some have said that a studio was where you bring in clients. Whatever. I don’t care actually. Enough talk. Here are the pictures. It’s not perfect, but it’s mine and I use it almost daily . I am very grateful for it! I know that for a lot of you, this is terribly messy. However, this is after I cleaned in there for 20 hours - it was really a mess! Seriously! What's important is that it works for me. Click on the arrows to get to the next picture. I was able to get it second hand from a local auction site. I've had such fun with this machine! 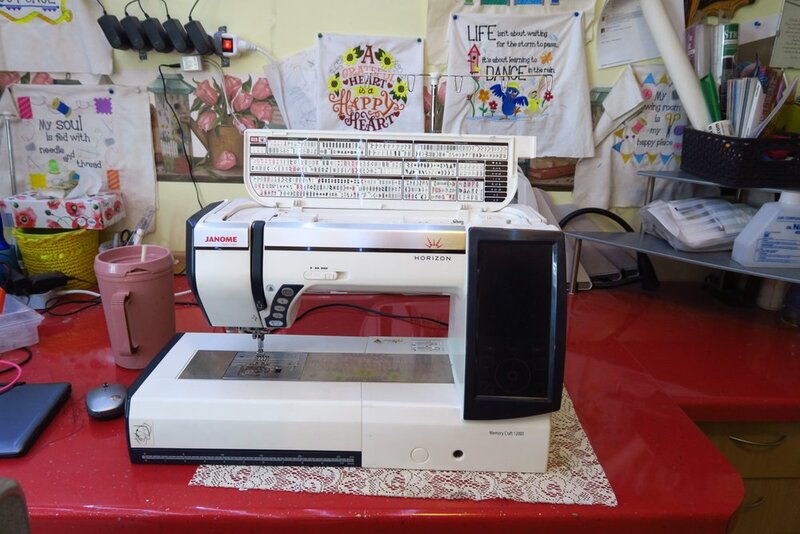 Janome 12000 - Like most, once I used a small embroidery machine, I wanted a larger one! I was blessed to find this via an on line auction and I believe it was for me. Yes. I found it second hand. A result of a divorce. It was almost brand new and a fantastic price. I put it here so that I could look out the window when I sew/quilt. When I am quilting, I do put a table to the left of my chair so that the quilts can rest there while I work. I recently got this new machine and put it here. I used to have a Janome 1600 QCP but it died a few weeks ago. This is a speedy industrial machine and I’m falling in love with it (as much as I would with any sewing machine). We put up the monitor on the wall and I use my tablet and using Chromecast, I can watch baseball games or You Tube or whatever on the bigger screen. I have a normal ironing board. There is an electrical outlet on the end of the ironing board. And now you know!!! This is where I make those charity quilts! Sandwiching all these charity quilt tops!